Grevillea ‘Coastal Glow’ is a hybrid whose parents are said to be G. barklyana and either G. asplenifolia or G. longifolia. Grevillea ‘Coastal Glow’ is a medium, spreading shrub that has reached a height of two metres in our cold climate garden. Young growth often has a reddish colour. The oblong leaves are 20 centimetres long and two centimetres wide. Some leaves have lobes. 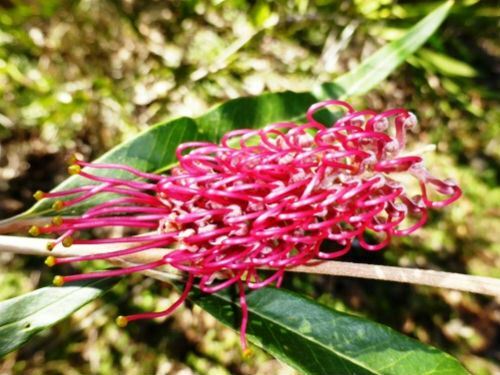 The beautiful flowers are toothbrush-shaped, on the ends of branches, seven centimetres long and reddish-purple. The flowering period extends from August to February. Blooms are conspicuous, profuse and attract honeyeaters. Light pruning, after flowering, is appreciated.